Short, starting to go bald and hiding it poorly by wearing a ponytail, a taste for cheap suits, cheap whiskey and cheaper cigars, Sid is the avatar of sleazy managers everywhere. 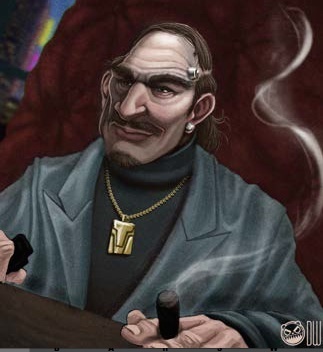 Sid has a chrome datajack in his temple, a large, fake diamond stud earring, his commlink in one hand and an obnoxious lit cigar in the other. Manages Matt Wrath.